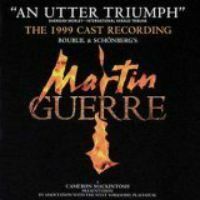 Touring Cast, 1999 (Dreamworks) (3 / 5) After Martin Guerre failed in the West End, producer Cameron Mackintosh tried again. 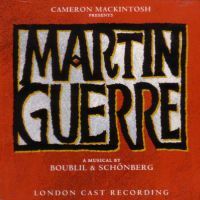 He had Boublil and Schönberg create a new touring version that represents one of the most extensive overhauls of any musical. Even though it follows the same general plot line, it’s an almost total rewrite, with many new songs and with melodies from the 1996 version reassigned and given new lyrics. The result is harsher, focusing even more on the religious strife that’s tearing Artigat apart. If at times the score is shrill, even hysterical, there’s plenty of dramatic power here. Alas, Stephen Clark alone translated the lyrics for the revised show, and they’re much weaker. For example, the new ballad “Live With Someone You Love” is a thesaurus of clichés. On the other hand, “Without You as a Friend” is a canny addition to the score. The title song and “The Imposters” are both still here (albeit with new lyrics), along with many other effective numbers, but William David Brohn’s orchestrations lack majesty. The new cast — Stephen Weller as Martin, Matthew Cammelle as Arnaud, Joanna Riding as Bertrande, Maurice Clark as Guillaume — is vocally skilled and dramatically apt. — D.B.